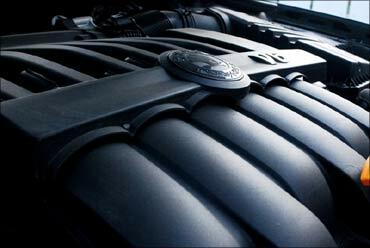 Are you a performance freak looking for a sedan propelled by a V6 power plant? If yes, your wait is over. The new Mercedes Benz E-Class (W212) is here - an aggressively styled German luxury sedan worth approximately half a crore (Rs 5 million). 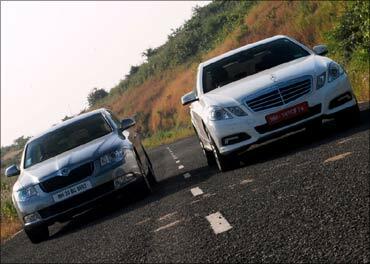 Lest you forget, the Skoda Superb V6, a luxury sedan based on Volkswagen Passat's platform with a bit of a stretch to increase the space, cheaper than the W212 by about Rs 20 lakh (Rs 2 million). 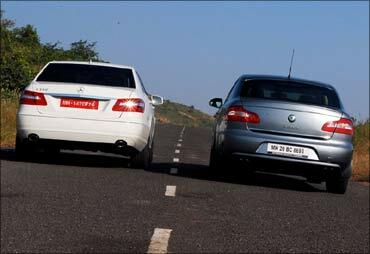 The E-Class has a crisp crease line rising towards the rear with a chrome strip and a beltline moving almost parallel with the swage. The parallelogram shaped twin headlamps, five spoke alloys and the extended tail lamps to the fenders add an oomph factor to the W212. The rake, the longer hood (thanks to the longitudinal engine positioning) and the hood shut lines running up to the A-pillar further add an appeal to the W212. On the other hand, the new Superb carries the aggressive look with its prominent strakes which sandwich the bulge on hood giving it a more nose-cone look. The large glassed-in area with a chrome stripe border coupled with the smaller hood for the transversely placed motor gives it a modern and compact car look. 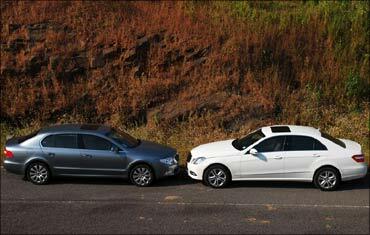 Dimensionally both the sedans are similar; the W212 is 30mm longer, 37mm wider and 9mm taller. The E-Class sports 245/45/R17 tyres while the Superb has 225/45/R17. 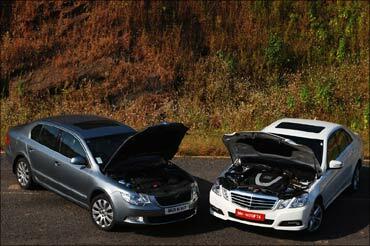 The inclined chrome strip and the larger engine bay makes the W212 look larger than the Superb V6. Get inside the Merc and you will feel like as if you have boarded an airplane with grey and black instrument panel paired with beige leather seats that are light on eyes; and switches well integrated in the car. Climb into the rear seats and you will be amazed with the comfort and features the E-Class has to offer. On the contrary, inside the Skoda Superb you will find the black and beige interior combination less complicated making the Superb look brighter than the W212 from inside. 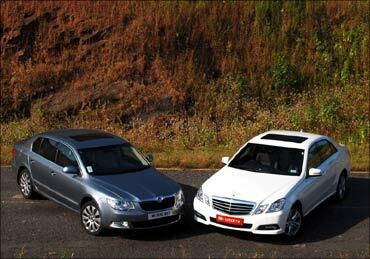 The wheelbase of the Superb is smaller than the E350 by 113mm; however, don't be under the misconception of the Superb offering less space than the E350. When it comes to space, Superb is surely the big daddy of the two, thanks to the transversely placed engine in the Superb compared to the longitudinally placed power plant in the E-Class that makes Superb more spacious. Behind the wheels of E350, experience is nimble and fun. 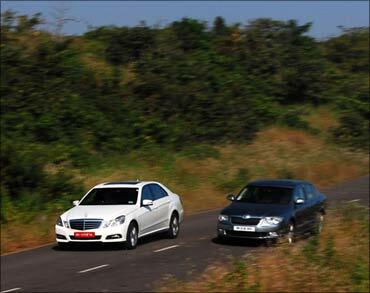 The drive is silky smooth and the W212 doesn't feel light-footed like the W211, but the E350 doesn't encourage pushing it hard; the comfort feel of the sedan encourages to hypermile. However, when pushed, the E350 is sure to leave most cars lug behind. The V6 motor on the Benz is peppy, smooth and at higher revs it produces sweet sound notes. The steering wheel is light, but feels artificial with an electronic feedback to it. Dive into a corner in the E350 and it will handle brilliantly with no sign of oversteer thanks to the ESP. Night driving in the E350 isn't an issue as the HID headlamps have a good spread and reach and the E350 actives the cornering lamps while turning increasing the visibility. If E350 was likeable for the quickness, then the superb V6 is lovable. Not because it can zip past like the E350 but the drive in high or low speeds is much composed. The Superb is a well-poised sedan when it comes to handling. The fourth-generation Haldex clutch electronically transfers power to the rear wheels, when the front wheels loose traction, cutting understeer effects. The steering becomes heavier at higher speeds and the car can be tossed into corners without much difficulty. 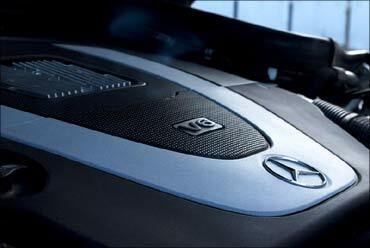 The V6 power plant in the Superb is very lively and encourages you to press it as hard as your bravado will allow. The night driving test was surely won by the E350 as we felt it had better headlamps than the Superb was carrying though Superb also sports the cornering lamps like its competitor. The only disappointment with the Superb V6 engine was its requirement of 95 octane petrol, which is quiet sparely available all across India. We had to carry octane boosters with us. A conclusion as to which car tops the chart is a difficult decision to make. 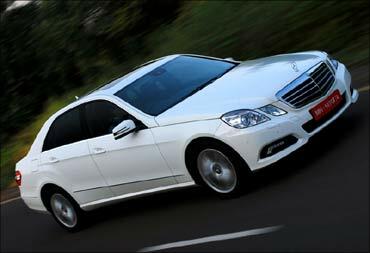 The Mercedes Benz E-Class stands on top for the luxury and showstopper it is for the luxury. 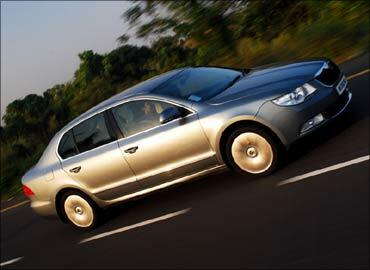 But the Skoda, we feel, is more value for money at the price that it comes with not much compromise on design and luxury.